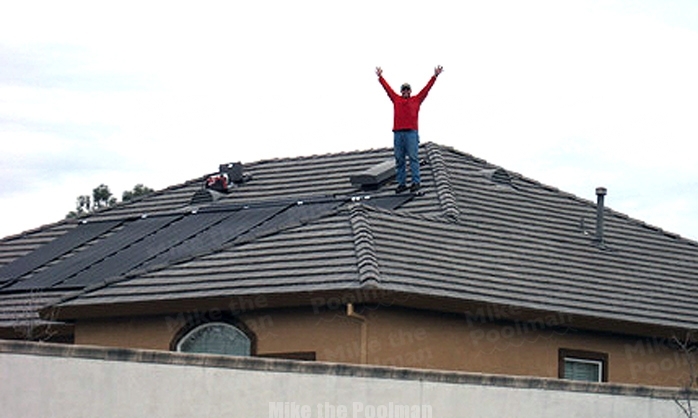 Home > When is it time to turn on/ open pool solar? When is it time to open the swimming pool solar system for the swim season? I’m asked this question every spring when the weather gets warm. I always wait until May but is it worthwhile to open the solar and turn it on in March/ April? My answer: If you are going to swim in 65 degree water then my answer is YES. At an air temperature of 80 degrees Fahrenheit you might heat your existing 58 degree water to 65 degrees. Are you really going to swim in 65 degree water? Of course not. Resist the temptation, don’t turn it on. The nights are still too long for the pool to retain much of the heat you gain. So, even if the pool gets to 65 you’ll lose it overnight. If you want to heat your pool you’ll have to run your pump in the afternoon when electricity is more expensive. If you aren’t going to gain any heat in the pool why pay extra in utilities? I suggest leaving the solar off and running the pump in the morning and complete its schedule by noon. a) When you warm up the water you give algae more of an opportunity to grow. When you have more algae you need more chlorine and acid to sanitize and balance the pool water. Yes, you’ll end up spending more money on chemicals (and aspirin) if you turn on the solar early. b) But, what if you have a weekly pool service that includes chemicals in their monthly fee? While it’s true it won’t cost you any money in the short run it will likely cost you money in the long run… What happens when companies lose profit? They have two options- raise rates or go out of business. So, if you’re forcing your pool service to add more chemicals it’s only a matter of time before they have to raise rates to account for the added cost or you lose them and have to find someone else to trust with your investment. It costs more in electricity to run your pool pump in the afternoon (if you have tiered rates as we do in Sacramento/ El Dorado Hills). And, even if you have a variable speed pump it still costs more because the pump ramps up to a higher speed and consumes more electricity to get the water up to the roof, through the solar collectors and back to the pool. So, while it’s fashionable to know that you’re solar is working away heating the pool in February, March and April, IT’S REALLY JUST COSTING YOU MORE in chemicals and electricity! Until the weather allows the water to stay at 78 or above leave the solar off and save yourself money.